I believe we have today a unique confluence of factors that are enabling and accelerating progress in self-driving car technology. If you are not expecting self-driving cars to start hitting the streets around the world in the next 5 years, then I would urge you to reconsider your assumptions. Probably the most important factor at play is Tesla’s success, which has made electric cars a reality, and emboldened large technology companies like Google, Apple, Samsung Electronics and Baidu to explore expanding their reach into the car market, in which they have historically had limited if any presence. After all, once you replace the internal combustion engine and transmission with an electric motor powered by batteries, a car starts to look like a computer on wheels. Computers have already been flying airplanes for a long time, so imagining that computers could also drive a car shouldn’t be that difficult. 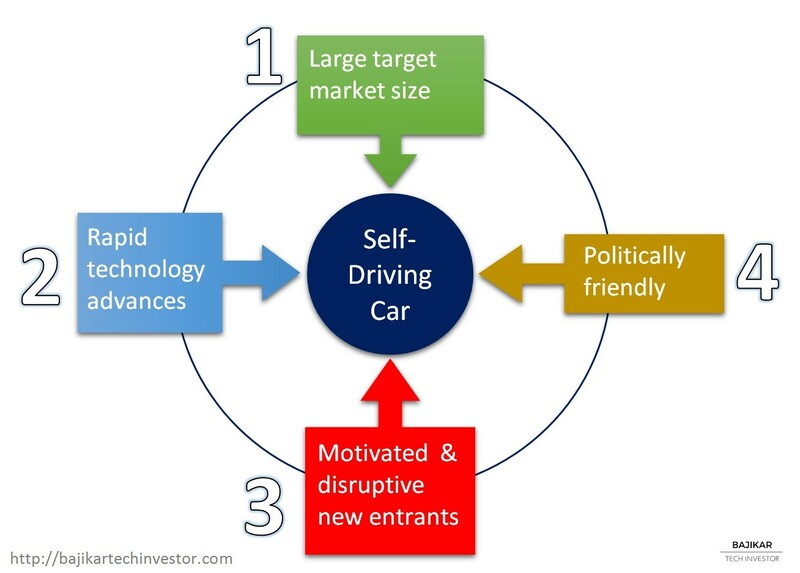 The chart below captures the 4 factors that I believe are in play, promising to make self-driving cars street-legal sooner than you think. The topic of self-driving cars is close to my heart because I did research work on autonomous navigation back in graduate school at the University of Minnesota, through projects funded by the Minnesota Department of Transportation, for the safety of snowplows. Even after I left Minnesota, I was continually involved in R&D focused on location and security technologies during my time at Intel and Stanford. In other words I have followed progress in this area over the last twenty years. Regardless of whether you have any background or experience in this area, it is hard to miss the flurry of recent announcements and media coverage surrounding self-driving cars. According to a survey published by AAA Foundation for Traffic Safety last year, Americans on average made two driving trips per day, spending 46 minutes behind the wheel. If you are not driving your car, then perhaps you want to be productive doing something else, or you want to be entertained while you are being driven around by your car. This represents a potentially large opportunity for next-generation immersive infotainment technologies. If you thought security and privacy of your Smartphone was important, think about the importance of such protections for your car, as it transforms into the ultimate connected mobile device. According to the WHO and others, approximately 1.3 million people are killed every year in traffic accidents. Reducing CO2 emissions is major focus of governments around the world for effectively addressing concerns around climate change. Passenger safety and prevention of environmental pollution have both been important factors influencing the automotive market, and self-driving electric cars hold enormous potential to drive solid progress on both fronts. From an investment perspective, there are a number of potential opportunities that are being created due to this multi-year secular dynamic – sensors, batteries, deep-learning algorithms and computer technology, and Cloud-based infrastructure to enable autonomous navigation are some examples. 1. What is motivating newcomers (Google, Apple, Tesla, others) in the self-driving car market and why is the threat for traditional car makers real? 2. What will be the potential nature and magnitude of disruptive impact on the automotive industry from self-driving cars? 3. What are the different approaches and competing technologies used for implementing self-driving car capabilities and how do they compare with each other? 4. How will self-driving cars and associated advanced ride-sharing services potentially affect adjacent markets like automobile insurance? 5. What types of investments can individuals or institutions make to capitalize on self-driving car industry dynamics? Download the full report on Counterpoint’s website (clients only). If you have other topics or specific questions that you would like to see covered in detail, please leave a reply below, or get in touch via email. 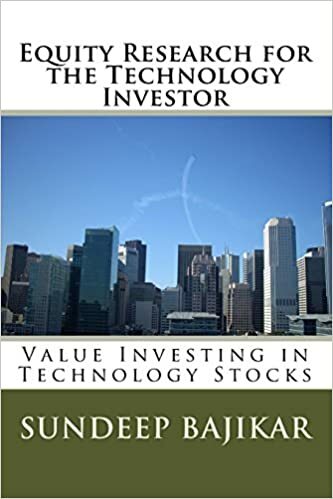 Disclosure: At the time of this writing, the acteve Model Portfolio held long positions in AAPL, IBM, INTC, MSFT and MU stocks. Source: Stock market data provided by Sentieo. Mobile device industry data provided by Counterpoint. Global Auto Manufacturing revenue estimates based in part on J.D. Power whitepaper. A copy of this post was also published on Counterpoint’s blog.